Get Ready- an NCCI increase of the primary-excess split point could raise your primary losses and negatively influence your mod. NCCI published “Item E-1402—Revisions to the Experience Rating Plan Primary/Excess Split Point Value and Maximum Debit Modification Formula” on August 04, 2011. NCCI recently completed an Experience Rating Plan (Plan) methodology review. As a result of that review, and in order to maintain the Plan’s optimal performance, NCCI has submitted Item E-1402 for state regulatory approval as announced in Circular CIF-2011-14.The split point is the value at which a claim is split in the experience rating formula between primary and excess loss amounts. NCCI is currently seeking regulatory approval for this split point update under Item E-1402. Once approved, the filing will become effective with each state's loss cost (rate) filing, beginning 2013. What is the proposed split point transition plan? National Insurance Application Systems, Inc. has only one mission – to create as many measurable differentiators as possible for our member agents – resulting in higher policy counts, profits, closing ratios and spectacular growth. AcuComp® improves loss ratios an average of 30 percent and permanently lowers experience modifiers together with premiums an average of 27 percent over time. National Insurance Application Systems, Inc.
NCCI Increases Split Point in Experience Rating Methodology - Our Agent Base Will Have the Advantage Over the Chaos to Come. At the Annual Issues Symposium 2011 in Orlando, FL, The National Council on Compensation Insurance (NCCI) Chief Actuary Dennis Mealy delivered his State of the Line report. This year's report outlines the continuing difficult trends facing the workers compensation industry and includes a "deteriorating" market forecast. Mealy shared the news that the primary-excess split point is increasing. Small losses – those less than the split point – have NO excess value, primary losses work as an indicator of loss frequency. Large losses – those over the split point – always generate some excess value, they work as an indicator of loss severity. Primary losses are used at their full value in the mod calculation, while excess losses are reduced by the weighting factor. This follows the concept “severity follows frequency.” A company with several small losses will have a higher mod than a company with only one large loss (all other things being equal). t this point there is no telling what other weighting factors may be changed as this is instituted- but the results are predictably shocking. 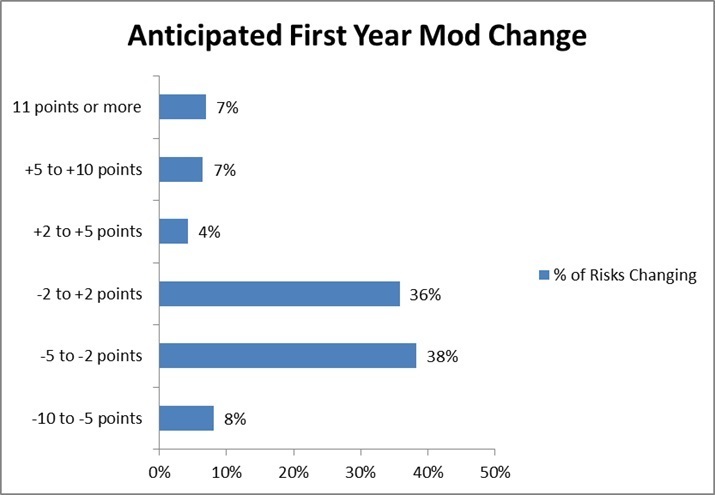 Every mod calculation is different- but both credit and debit mods saw dramatic increases. We strongly believe our agent base will have a unique advantage to capitalize on the chaos to come. Why change? The average cost of a claim has tripled since the last split point update two decades ago. Because of this, the portion of each claim that flows into the experience rating formula at full value (primary loss amount) is much smaller than what it was 20 years ago. The result is that the Experience Rating Plan is giving less weight to each employer’s actual experience. The Plan formula has become less responsive and individual risk experience rating modifications have gravitated toward the all-risk average over time. To address this issue, a transition plan to increase the split point amount over time is proposed. What Should Brokers and Their Clients Do? 1. 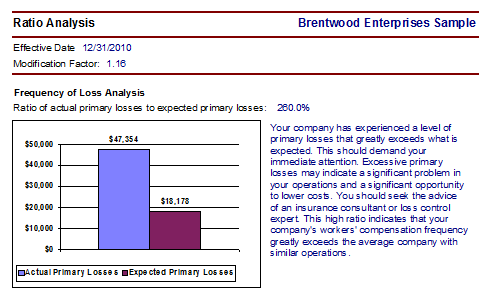 What is the company’s current ratio of actual to expected primary losses, and actual to expected excess losses? If the company currently has a primary loss (frequency) problem now, then start talking about safety measures and hiring practices to reduce the incidence of losses, and realize the importance of keeping losses medical-only, in states where the medical-only reduction applies. 2. What is the company’s current mod? If it’s at or only slightly under 1.00, and the company is one that must have a 1.00 or other value to bid on certain jobs, then take a look at the current mix of their losses and what they can do to assure losses are under control in the next couple of years. NCCI is also suggesting a change to the maximum mod formula. The purpose of this formula is to cap, or limit, any debit mod (a mod over 1.0) that exceeds a specific amount. The capped mod typically applies when expected losses are quite low in comparison to actual losses. Because the cap is determined by a formula related to expected losses and average claim cost (a number adjusted each year by NCCI), it is risk-specific. •	Nearly half of your clients will see a mod decrease of 2 points or more. •	Over a third of your clients will experience a small mod change of -2 to +2 points. •	If your clients are average, 1 in 7 will experience a mod increase of 5 points or more. All of these changes are a great opportunity to be conversing with your clients and prospects about the minimum mod, the controllable mod, the maximum mod (when it applies to them) and the possibility of a mod change. The NCCI presentation also mentions some other possible forthcoming changes, but it appears that only the split point and maximum mod formula changes will be filed for approval by the states this year, in anticipation of a roll-out in 2013.